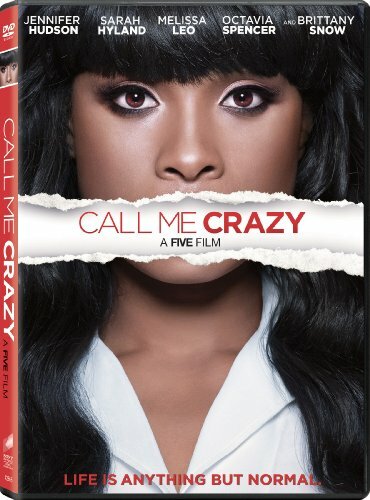 CULVER CITY, CALIF. (February 26, 2014) - Call Me Crazy: A Five Film , the gripping, yet hopeful Lifetime original movie that brings new understanding to what happens as a loved one struggles with mental illness, arrives on DVD May 6 from Sony Pictures Home Entertainment. An extension of the much-lauded Five franchise that started in 2011, this series of five, interwoven short films, each named for its main character, originally premiered on April 20 to more than 1.3 million viewers. Written by Jan Oxenberg, Deirdre O'Connor, Stephen Godchaux, Erin Cressida Wilson, and Howard J. Morris, Call Me Crazy: A Five Film has star power behind the camera as well, with Laura Dern, Bryce Dallas Howard, Bonnie Hunt, Ashley Judd, and Sharon Maguire directing the anthology. The inspirational visions explored in the film take on issues including schizophrenia, bipolar disorder, depression and post-traumatic stress disorder. The film stars Academy Award(R) and Golden Globe(R) winners Jennifer Hudson (Best Supporting Actress, Dreamgirls, 2006), Melissa Leo (Best Supporting Actress, The Fighter, 2010) and Octavia Spencer (Best Supporting Actress, The Help, 2011). The ensemble cast also includes Sarah Hyland (TV's "Modern Family"), Sofia Vassilieva (TV's "Medium"), Brittany Snow (Pitch Perfect), Ernie Hudson (TV's "Oz"), Jason Ritter (TV's "Parenthood"), three-time Emmy(R) Award-winner Jean Smart (TV's "Samantha Who? "), Lea Thompson (TV's "Switched at Birth"), Melanie Griffith (Working Girl) and Chelsea Handler (TV's "Chelsea Lately"). Call Me Crazy is executive produced by Jennifer Aniston, Marta Kauffman, Kristin Hahn, Kevin Chinoy and Francesca Silvestri, all of whom executive produced last year's critically acclaimed Lifetime Original Movie "Five." The movie is produced by Sony Pictures Television, Echo Films, More Horses Productions and Freestyle Picture Company. An anthology of five short films, Call Me Crazy: A Five Film explores the impact of mental illness on people's lives and those around them. Each film highlights the powerful relationships built on hope and triumph while helping raise a new understanding of what happens when a loved one struggles. Starring Academy Award(R) and Golden Globe(R) winners Jennifer Hudson, Melissa Leo and Octavia Spencer, Sarah Hyland, Sofia Vassilieva, Brittany Snow, Ernie Hudson, Jason Ritter, three-time Emmy(R) Award-winner Jean Smart, Lea Thompson, Melanie Griffith and Chelsea Handler. Broadcast Year: 2013. Call Me Crazy: A Five Film has a run time of about 88 minutes & is not rated. "Emmy(R)" is the trademark property of ATAS/NATAS. "Golden Globe(R)" is the registered trademark of the HFPA.